Most pregnant women don't track their hCG, or human chorionic gonadotropin, levels unless they have undergone fertility treatment or are experiencing pregnancy complications. Produced by the growing placenta during pregnancy, hCG is the hormone that home pregnancy tests detect in the urine. With a home pregnancy test, all you get is a positive or negative result. Blood tests, on the other hand, measure the actual amount of hCG present in the blood. If your blood levels of hCG don't rise appropriately, this may indicate that there is a problem with your pregnancy. Normal hCG levels vary considerably from one woman to another, so they are reported as a range of values. For example, at 3 to 4 weeks after implantation of the embryo into the wall of the uterus, a normal hCG level may range anywhere from 500 to 10,000 IU/L. According to an article published in May 2007 in "Canadian Family Physician", hCG levels rise most quickly during the first several weeks of pregnancy, doubling about every 2 days. By the 8th to 10th week of pregnancy, the rate of increase slows, with hCG levels typically doubling about every 5 days. hCG levels generally peak by the 14th week of pregnancy, after which they begin to fall and then stabilize at a lower level. 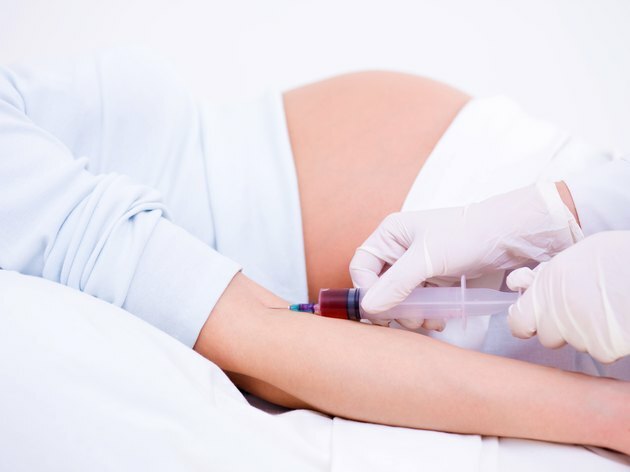 If your hCG level doesn't rise during early pregnancy, especially during the first 8 to 10 weeks, your doctor will probably repeat your blood test. Even during early pregnancy, a single hCG reading that is similar to the previous level may be normal, but if the repeat hCG level remains the same or has fallen, this suggests that the pregnancy may not be progressing normally. Looking at your hCG levels over time is an important way for your doctor to assess whether you will continue to have a normal pregnancy. hCG levels are not the only way to determine whether your pregnancy is progressing normally. Your doctor will most likely recommend an ultrasound if you have a plateauing or falling hCG level in early pregnancy, depending on how high your hCG has risen. Typically, doctors would expect to see evidence of a pregnancy on ultrasound by the time your hCG level has reached 1,000 to 2,000 IU/L. Failure to see a gestational sac -- the fluid-filled area surrounding a developing fetus -- at this stage could indicate that there is a problem with your pregnancy. hCG levels that rise more slowly than expected or stop rising during early pregnancy may be an early indicator that the pregnancy will end in a miscarriage. Less commonly, a low or plateauing hCG level during early pregnancy is caused by an ectopic pregnancy, in which the embryo starts to grow outside the uterus, usually in a fallopian tube. An ultrasound can help your doctor determine whether you have an ectopic pregnancy. If you have symptoms of a miscarriage or ectopic pregnancy, such as vaginal bleeding or abdominal pain, contact your doctor immediately. What Is a Normal hCG Level in Males?